If Queensland was a country it would be among the top ten sporting nations in the world. Such is the recent dominance of Queenslanders at Olympic sports that if Queensland was a country it would have won five individual gold medals at the 2008 Olympic Games, and had a major hand in winning two team gold medals. Seven gold medals would have placed Queensland equal ninth with the rest of Australia, France and the Netherlands overall. But the measure of a sporting landscape isn’t necessarily in results and statistics, impressive though these are for Queensland in a whole range of sports, it is also in the amount of space devoted to sport and the impact that these landscapes have had on a wide variety of sporting pursuits. Sport in Queensland both for participants and spectators is a major source of pleasure and pride and contributes to the sense of a Queenslander identity. This was epitomised in 1995 when Maroon player Billy Moore audibly chanted the motivational words ‘Queenslander, Queenslander’ all the way down the players’ tunnel onto the Sydney Football Stadium in the first of that year’s State of Origin rugby league games. Nowhere is the sporting landscape of Queensland more evident than from the air – either from a plane or from Google Air. Fly over the vast expanse of Queensland and surrounding every small settlement you will see the distinctive crop circles and rectangles of playing fields and the showground, the grids of the tennis or netball courts and the flash as the sun catches the town swimming pool. Outside any major settlement you will also easily pick out the racecourse and the lines of exotic trees sculpting the golf course. While this is also true of many parts of Australia, it is certainly not true for the rest of the world where sporting facilities are concentrated and clustered in the landscape. In contrast in Queensland they are dispersed and regular, as reliable as finding a pub. To live on the coast of Queensland gives access to the water. To live inland means taking advantage of community based sports which define the rhythm of the seasons. In the 1865 atlas of early European settlements in Queensland the sporting imprint was clearly on the landscape, much like from the air. There was a defined sporting landscape and, importantly, landscape waiting for sport. Land had already been gazetted and deliberately set aside for sporting pleasures. 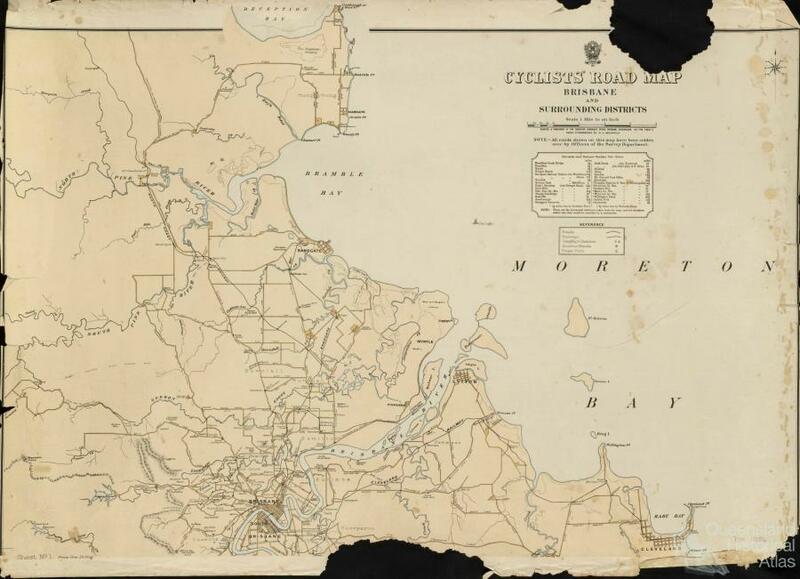 The 1865 map of Brisbane locates the town 20 kilometres inland on the winding Brisbane River. Zoom in and you can see the emerging sporting landscape – a large recreational area named Queen’s Park and the Botanical Gardens; at least six areas designated as public baths and bathing reserves located on both sides of the river; a cricket ground in north Brisbane and a reserve for the rifle range. On the map of nearby rival town Ipswich, sited on the Bremer River, is shown a large area on the east reserved for botanical gardens and public recreation and a number of reserves. The games consist of flat races, three-legged races, putting the stone, throwing the hammer, catching a greased pig, climbing a greased pole, and two, which will be entirely new to this colony – namely, a bicycle race 500 yards, and tilting at the ring. A gathering in 1870 featured bicycle races near the grandstand at the Brisbane Botanic Gardens. It was held inside a large circular enclosure formed by ropes. Information about the new colony Queensland was provided by maps, almanacs and gazetteers. In 1876 a Queensland edition of the popular Bailliere’s series was published entitled Queensland Gazetteer and Road Guide. Written by journalist, horse-breaker and riding master Robert Whitworth, who had returned to journalism after a fall from his horse, this gazetteer contains detailed information on horses and horse racing in Queensland, as well as noting the range of other sports and leisure activities engaged in. Whitworth describes more than 45 racecourses outside Brisbane. 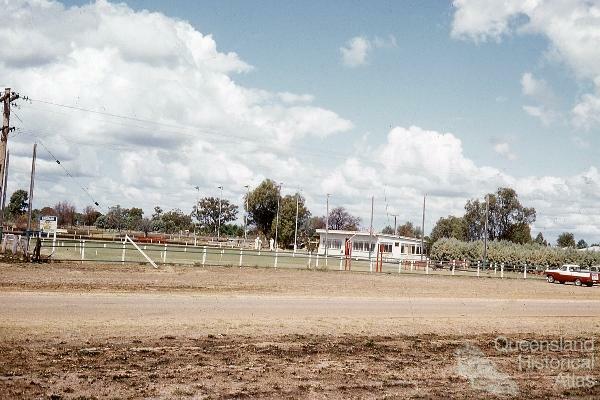 At Ballandean there were ‘no public buildings of any kind … but it has a racecourse attached, known as the Britannia racecourse, where local meetings are occasionally held’. The land for each racecourse was granted from the government for recreational purposes to ‘trustees’ or self appointed citizens in each area. Once fenced, an entry fee could be levied. Whitworth’s survey, of course, reflects his own sporting interests, but his analysis provides an insight into the extent of recreation and leisure pursuits in all the towns and villages throughout the colony in 1876. He records rich details of horse racing and turf clubs, billiard rooms, cricket grounds, stretches of water where he describes sailing regattas, boat racing, yachting, shooting water fowl and ducks, fishing, bathing, destinations for excursionists, and general recreational reserves that even hosted ploughing matches. While Whitworth concentrated on the role of the horse in Queensland it was the ‘iron horse’ that began to change the landscape of towns and cities. 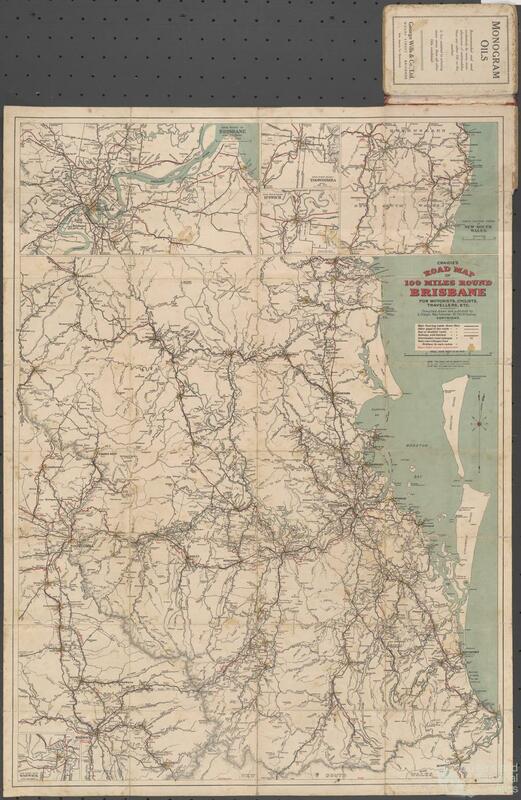 By 1896 cycling had become so popular as a recreation that it warranted a cycling map of Brisbane roads and surrounds produced by the Surveyor Generals’ Department and printed and sold to cyclists. Cyclists could ride to the racecourse, hotels, vineyards and beaches. 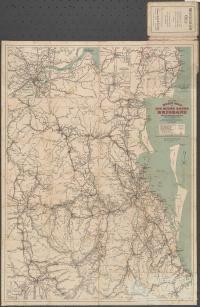 This map provides details of the condition of the road as well as the destinations. These notations are not included once the car begins to dominate the landscape. 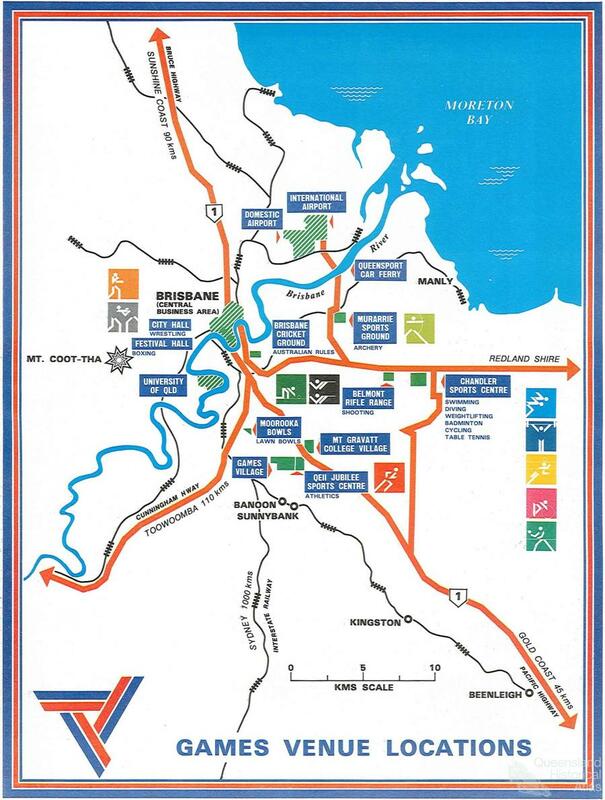 Less than 20 years later Kenneth Craigie published his Road Map of 100 Miles Round Brisbane for Motorists, Cyclists, Travellers etc, the 1914 map is booklet size and designed to be folded into sections for ease of use on the road. 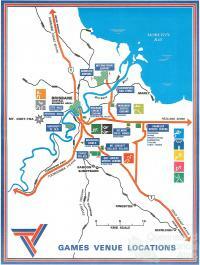 The road map extends the limits of cycling (about 25 miles) to a day’s car ride of 100 miles. Day trips for pleasure could be taken to Nambour in the north, Tweed Heads in the south and Toowoomba, Warwick and Nanango in the west. Reflecting the dominance of the car, the map shows where Shell benzene fuel can be bought. It can be argued that sporting facilities in country areas of Queensland provide a vital part of the social fabric of the community – catering to young and old, women and men. There is evidence that often it is the community itself that selects and clears the land in what came to be known as ‘working bees’. Despite the hard work, the landscape was transformed for the benefit and pleasure of generations of players. The location of sporting facilities is directly related to the amount of space they require. On the outskirts of towns are rifle ranges, clay target and pistol clubs, the racecourse and golf course. Closer in are the bowls clubs, show grounds and general recreation grounds often hosting a combined football and cricket field, with designated netball courts, swimming pool and tennis courts. Schools have their own sporting facilities which sometimes are shared with the town. Any nearby river or large dam is utilised for fishing, boating and swimming. The success of local teams is a direct source of pride and identity. Queensland country areas have produced an extraordinary number of outstanding national champions as well as international champions including athlete Cathy Freeman from Mackay, tennis players Rod Laver from Rockhampton and Pat Rafter from Mount Isa, golfers Karrie Webb from Ayr and Greg Norman from Mount Isa. Every country town has its own sporting legends. Coastal towns have similarly generated a wide variety of world sporting champions including kayakers, tri-athletes, sailors, swimmers and divers. Sports grounds in remote and regional areas were adapted to the Queensland climate. Where water was scarce golf courses were shaped with plenty of rough. Sand greens needed to be swept after putting. At Longreach the bowls club founded in 1945 has retractable awnings over the greens to protect the players from the harsh sun. After the installation of lights many bowls clubs, like the one on Thursday Island, hosted night bowls. Horse racing tracks, such as those at Birdsville or on Bamaga Island in the Torres Strait, feature clouds of dust rather than grass. The impact of sport on the landscape has been dramatic in the Queensland capital Brisbane since the late nineteenth century. Here the emphasis is on the pleasure of the spectators rather than the players. Large multi-sport stadiums have been constructed within the city including the Gabba Cricket ground in Woolloongabba in 1895 which has hosted cricket, Australian Rules as a winter sport since 1959 and greyhound racing from 1972. This space had been created in 1876 as a recreational ground for public use. Rugby League, Rugby Union and Soccer utilise Lang Park built in Milton in 1962 over the old cemetery and now called Suncorp Stadium. Milton also housed the major tennis venue (featuring the big racquet), and hosted Davis Cup matches in the 1950s and 1960s. At major matches centre court was supplemented by massive temporary scaffold-supported stands. Olympic size pools were constructed in Townsville after WWII including the memorial Tobruk, Long Tan and Kokoda Pools and in 1959 the Centenary pool at Brisbane was opened in Spring Hill. Brisbane has been the host to a range of national and international events, including the Australian ‘Paraplegic Games’ at the Clem Jones Recreation Reserve in Carina in 1966, but perhaps the greatest impact on the sporting landscape occurred in 1982 when Brisbane hosted the Commonwealth Games. Preparations began ten years earlier with the construction of an athletics stadium in what was then the bush in the outer suburb of Nathan. The financial impact of the infrastructure was significant with the federal and state governments and Brisbane City Council providing $35 million between them. The athletics complex cost $20 million, with the nearby 40 hectare site of the Chandler Centre costing $12 million to host swimming, diving, badminton, cycling, and weightlifting. 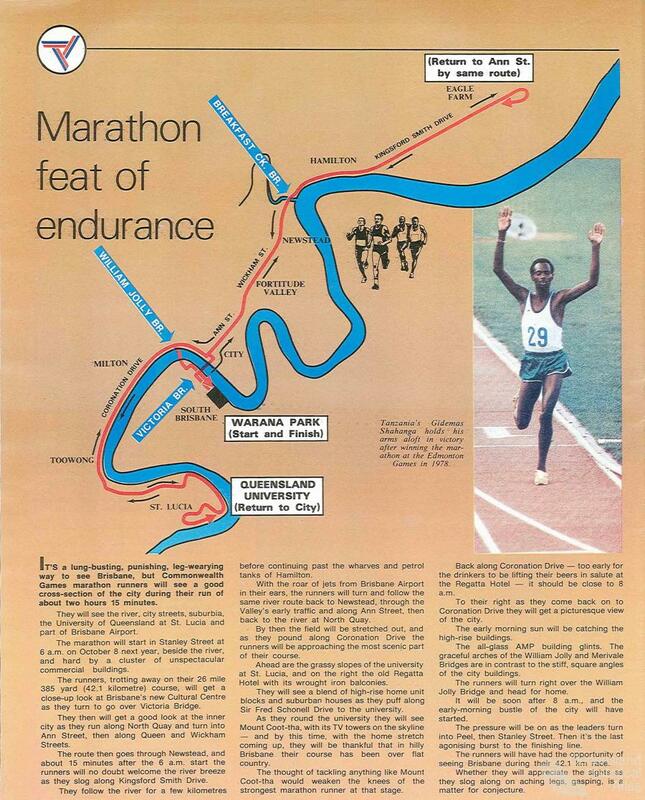 The 1982 Commonwealth Games were attended by 2150 athletes from 45 British Commonwealth countries. Eleven events were contested including swimming and diving, athletics, lawn bowls, shooting, wrestling, archery, boxing, cycling, weightlifting and badminton. Table tennis was the demonstration sport. The city utilised four existing facilities including the Moorooka bowls club, City Hall for wrestling, the Belmont Range for Shooting and Boxing at Festival Hall. A reported 6000 private homes housed 40,000 overseas and interstate games visitors each of whom paid $10 per night under a ‘Home Hospitality Scheme’ that included a ‘tropical breakfast’. The athletes were housed at the Games Village now Griffith University campus at Nathan. 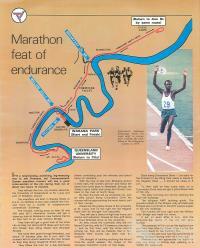 The Brisbane Telegraph souvenir magazine of the Games stated ‘Naturally, Brisbane is looking for something in return. It will get, among other things, greatly improved sports facilities for young Australians to enjoy for many years to come’. In addition to the facilities, the state government provided special grants to improve individual athletes. The landscape of Brisbane and surrounds was transformed. The sport that arguably takes up the most land and resources, including water, is golf. Some have argued, however, that golf courses can provide important wildlife corridors and habit. Golf more than any other sport utilises the outdoors for active pleasure. 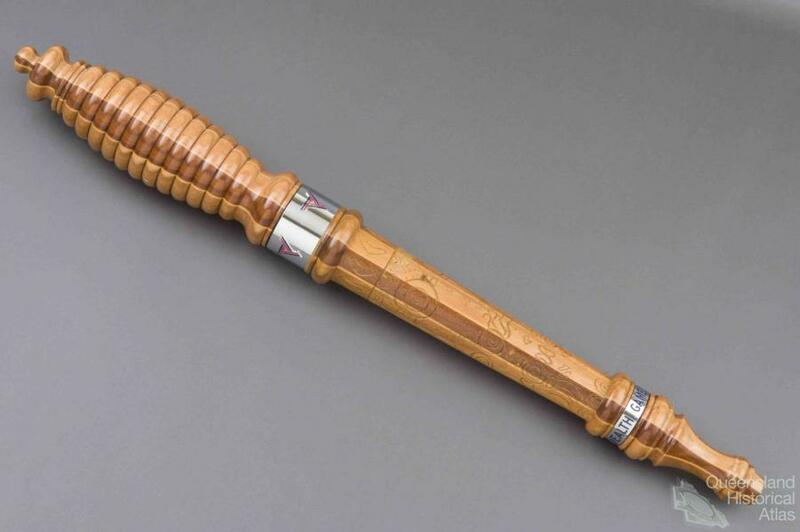 The first major golf clubs were established outside Brisbane and included The North Queensland Golf Club in Townsville (1893), the Charters Towers golf club at about the same time and Toowoomba (1896). The Brisbane Golf Club was formed in late 1896 at Chelmer moving to Yeerongpilly in 1903. Golf course land has also been converted to housing estates, or new courses established adjacent to prestige real estate, a model also employed at the State Tennis Centre in Tennyson by developers Mirvac. How many golf courses can we squeeze into Singapore? They eat up our land and there are just so many uses for our land, we are not like Australia you know. Singapore, occupies 704 square kilometres and supports 22 golf courses making it the country with the highest density of golf courses in the world (one for every 32 square kilometres). Queensland in contrast supports about 284 golf courses (approximately one for every 6523 square kilometres). Queensland has three levels of golf courses - public, private and resort courses. Each caters to different socio-economic groups in the local population, as well as to tourists. Queensland devotes significant space to sport. In 2008 the then Queensland sports minister Judy Spence also stated that the Queensland government spent more money on sport than any other state. That investment has been rewarded since the 1990s with Queenslanders dominating membership of the Olympic team and its results. But it is arguably not only the amount spent on athletes, coaches and competition that achieves these results. Queensland’s sporting success and the pleasure that the average Queenslander takes in sport, can be seen in the landscape itself – from the bowling club on Thursday Island, to the sand greens of the local golf club in Longreach to the rodeo ground at Mount Isa.